Forum Index > Off-topic Talk > Only time and planning? Posted: Wed 26 Aug, 2009 2:03 pm Post subject: Only time and planning? search images of beheading swords, old, I found some photos (old and modern) that does not post here, for sensitivity, the swords I had never considered capable of causing disgust. In medieval times there are many full image of beheadings. For us, these full image does not have the same effect of modern beheadings. (I think in Iraq). I think the key determinants are: the time and planning. The time now so far away, fades the atrocities committed. The planning, the video or photo, must contain an idea (unhealthy) of premeditation. The violence and the actions committed during the video are planned to be shot from a camera. Yet the religious or political motives were often (if we exclude the executions of criminals). The effect of disgust is stronger now, why? Only time and planning? I apologize if the topic concerns a tragic aspect of the things we love most, swords. But this is part of them. I may have interepted the post wrongly. However this would be my personal take. Maurizio D'AngeloYet the religious or political motives were often (if we exclude the executions of criminals). The effect of disgust is stronger now, why? Only time and planning? In the days of old, The beheadings were a public display of the enemies to the Lords in their time. Thus a political or religous crime. These people who intended a rebellion were obviously against what the norm of the folk would have been in favor for. Therefore their beheadings would have been a happy sight, seeing as the rebel would have been extinguished. However on the flip side, there were perhaps many people who were on the rebels side vs. to be for the political or religous, and therefore the beheadings to these indivduals would have been just as atrocities. Today, beheadings are usually on the exact same note as the above mentions. There are those who are fore the actions and there is also those against the actions. All depends on what side you choose to take. Atleast that would be my personal take on the topic at hand. The beheadings that I think you're referring to are those committed by Jihadis and there is nothing humane about them at all. My understanding is that the condemned is bound and a Jihadi saws through the individuals neck with a knife, I wouldn't even kill an animal I was going to butcher in such a manner. In particular, I was referring to two pictures. 1) an English beheaded in Rome by the Inquisition. His guilt. He was a Lutheran. 2) a man beheaded in Saudi Arabia. His guilt. Did not accept the religion. What struck me more the latter. The sword is a weapon, this all we know. Served and serves to kill. Ancient knights hated the musketeers, and in them there was no honor in battle. We like to see the sword as a noble weapon, used to kill, but for noble purposes. Too bad that was not always so. I found these photos. Who used these blades had little noble. The teeth of the blade is opened in the flesh. I regret that manufacturing was Italian. Let's say a non-conventional weapon? 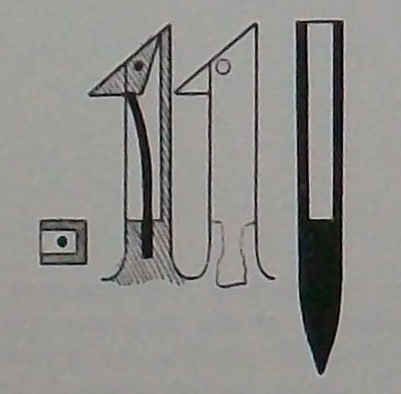 The opening mechanism of the teeth, was used a spring. Not really knowing all that much about the topic, I would have to say that these don't look like executioner's swords to me. 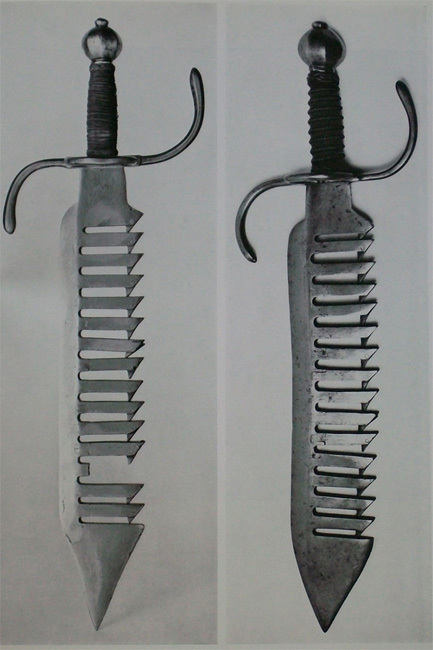 The 'saw-toothed' edge reminds me of parrying daggers I've seen with the same mechanism, used to trap a blocked blade. The blade-trapping functionality seems like it would justify the spring loaded (?) ends the diagram you attached details, perhaps to further trap the blade so it must be drawn out from the side rather than pulled back? Also, none of the executioner's swords I've seen pictures of have points, whereas these both have very pronounced points. Also, are those really chunky daggers or short swords? The photo makes it a little difficult to tell. Sorry if this is off-topic. Yes you are right. These swords are not to be beheaded. Served in general to counter the opponent's blade. This is right. If not used to counter the opponent's blade, but to hit the opponent against the body, had a devastating effect. This was all the more devastating as the opponent moves. I wanted to emphasize that the cruelty was and is always existed. Now, this weapon seems normal, but it is not. If it were used today, there seems to be butchers. The time is different, today, it belongs to us. Today I took my sword in hand, perhaps it's because I still have in mind as read and seen. The relationship between me and my sword has changed. P.S. the last edited regard only corrections some word badly traslated. The text has remained the same. these are two sword-breakers. were used from 1530 circa into duel with the rapier etc etc. Wonder if the break on the left-hand one means it was used? I see that the slots are on the leading edge. Is this universal, or were some the other way round (or ambidextrous)? The only back-edge-slotted and ambidetrous pics that I find on first search are replicas. Edit: I find a slots-to-the-back picture in Reinhardt, "The book of swords" (pg 122), which isn't labelled as a reproduction, and doesn't look new. are not replicas. They are true. Yes, I think, you're right, they have fought. The sword are two. by the book "Armi Bianche Italiane".